Azure Backup announced the support for alerting and monitoring in August 2016. 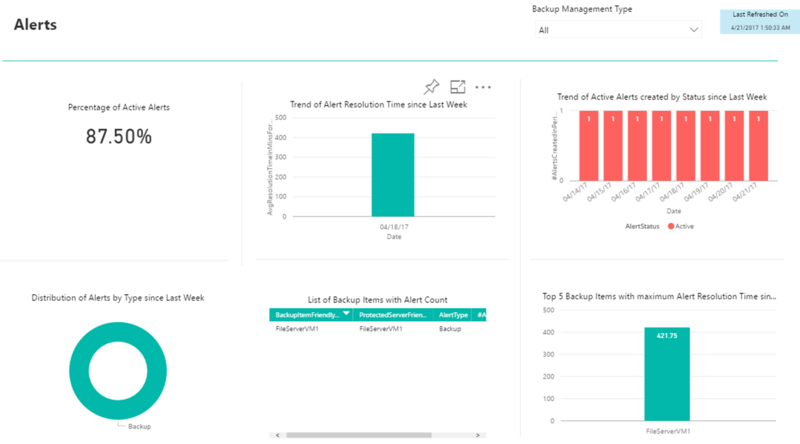 Taking it a step further, we are excited to announce preview of Azure Backup Reports using Power BI. 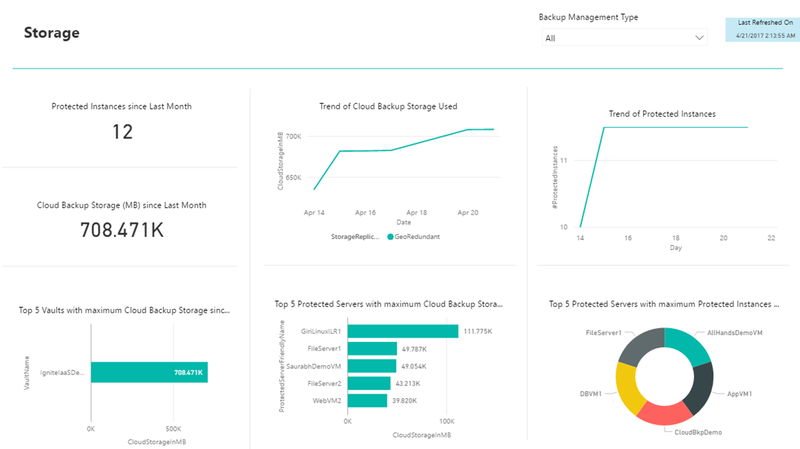 Azure Backup Reports provide the ability to gauge backup health, view restore trends, and understand storage usage patterns across subscriptions and across vaults. More importantly, this feature provides complete power to you to generate your own reports and build customizations using Power BI. Cloud based reports – You do not need to setup a reporting server, database, or any other infrastructure since everything is completely managed on the cloud. All you need is a storage account and Power BI subscription. The Power BI free tier supports reports for backup reporting data under 1 GB per user. Cross subscription and cross vault reports – You can view data across subscriptions and vaults to get a big picture view, track organization SLAs, meet compliance requirements across departments, etc. Open data model – You can now create your own reports and customize existing reports since the Azure Backup management data model is publicly available. Data visualization – You can take advantage of Power BI’s data visualization capabilities to perform business analytics and share rich data insights. Access control – Power BI also provides the capability to create organizational content packs, which can be used for sharing selected reports inside the organization and restricting access to reports based on their requirements. Export to Event Hub and Log Analytics – Besides the ability to export the data to storage account and connect to it using Azure Backup content pack in Power BI, you can also export reporting data to Event Hub and Log Analytics to leverage it in OMS and other tools for further analysis. You can configure Azure Backup reports using recovery services vault and import Azure Backup content pack in just a few steps. 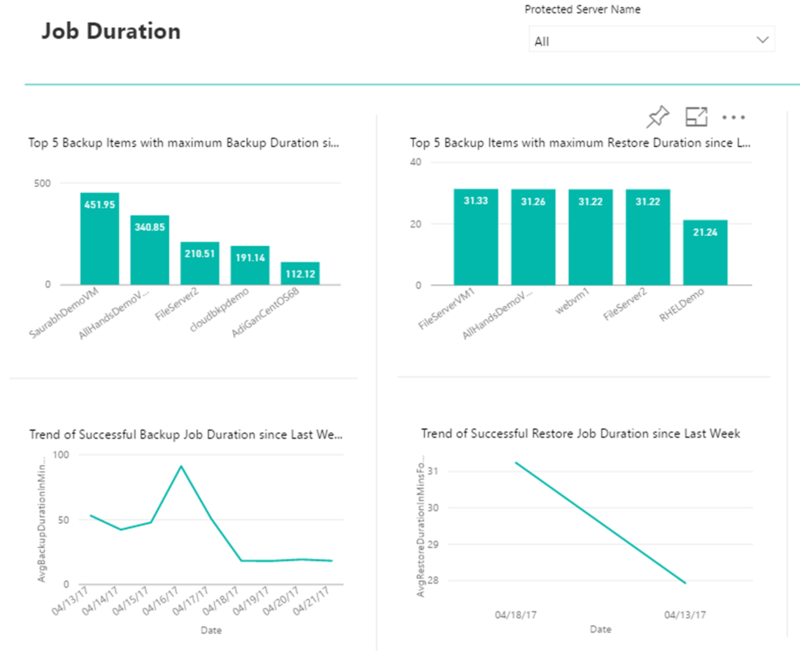 Once done, use the Azure Backup dashboard in Power BI to create new reports and customize existing ones using filters like vault, protected server, backup items, and time. Which protected servers had the highest protected instances last month? Which protected servers use the most backup storage and have highest impact on billing? 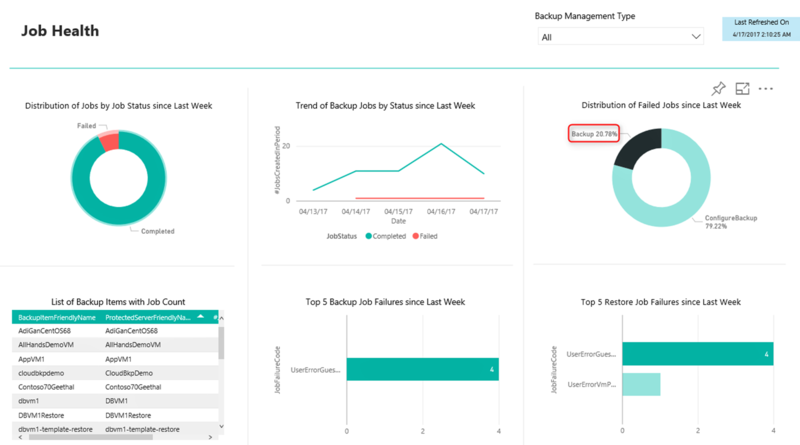 Was backup job failure higher than 10% last week? What were the top causes of job failures yesterday? Which backup items were impacted by these job failures? In the image below, Backup has been selected in Distribution of Failed Jobs donut chart; this updates all other visuals on this tab with backup failures related data. Which backup items had maximum data transferred last week? Are these items backed up during the same time period in a day? Which backup items had no successful backups yesterday? Which virtual machines had longest running jobs last week? Which folders take longest time to restore? Which data sources generated the most critical alerts in last week? What is the trend of alert resolution since last few months? Has the critical alert count reduced after latest version update? Getting started with Azure Backup Reports. 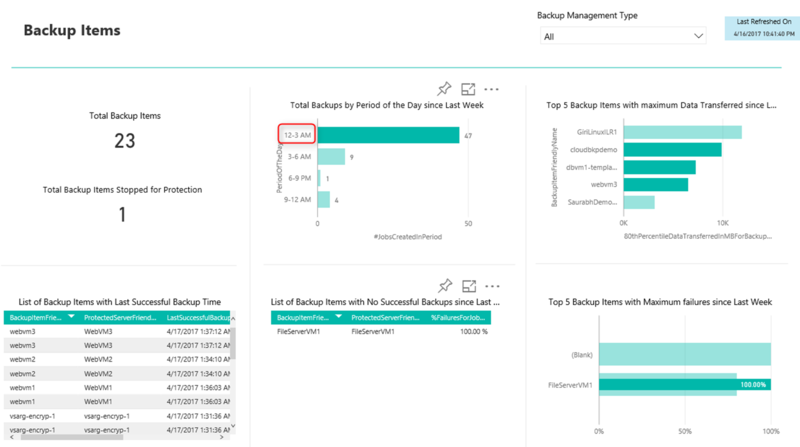 View Azure Backup data model to create custom reports.